A quick and easy recipe for a vegan apple crumbles (just like an apple crisp, if you prefer!) that you can make in your crockpot or slow cooker. Make sure to read the ingredients of whatever kind of granola you use, as many are not vegan. 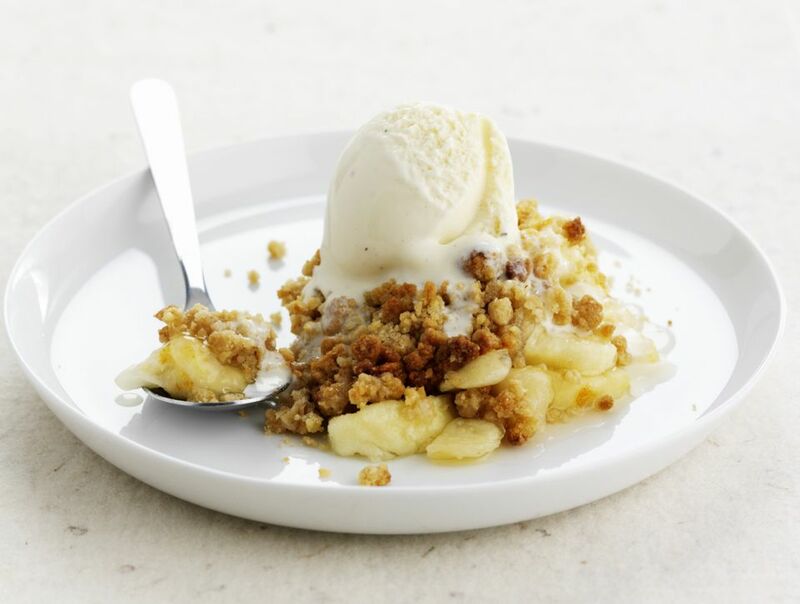 Refined sugar-free and vegan, this apple crumble or apple crisp recipe takes just minutes to prepare. It's made from fresh sliced apples sweetened with a bit of maple syrup (use real maple syrup, not bottled flavored corn syrup!) and topped off with a crumble granola, cinnamon, and nutmeg topping. Using granola for the top of this apple crumble means that there are no bowls to get dirty and nothing to mix. Just sprinkle everything over the top of your crock pot or slow cooker. Like waking up to a hot and delicious breakfast or coming home to a sweet dessert already ready to go? You might also want to try this recipe for crockpot peach cobbler or scroll down for a few more vegetarian and vegan crockpot recipes including a few desserts. Place apples in your crock pot or slow cooker. Drizzle with maple syrup, spices, and margarine, then cover with granola.